“The Wild Woman’s Way” is Michaela’s body of work drawn from her decades of counseling and from her training in a female lineage of Kashmiri Shaivism, of which she is now the lineage holder. This work is designed to provide education, inspiration and practical exercises for living as a woman in today’s world. Never before have we as women in the West had more opportunity, more choice, and more freedom. Granted, we still have a long way to go, yet compared to any other time in history, we have the greatest options and choices to forge our own paths and determine our own destinies. At the same time, with these opportunities come new challenges and distinct difficulties: the demands of life have created high levels of stress, pressure, disconnect, discomfort, and dis-ease in women. As women we are now, more than ever, able to have the career we want, we can make our own money, choose our relationships and have the freedom to determine the when and if we want children. Yet, our connection to our self, to pleasure, to nature and our intimate relationships has suffered. We are ever more disconnected from our biggest ally -the body- and as a result are missing out on a powerful natural resource for aliveness, pleasure and empowerment. All offerings draw from Michaela’s decades of professional and personal experience and are an invitation to remember the innate wisdom of the body—not to be defined by our looks and shapes and sizes, but the living, feeling body as a portal to unlocking who we truly are. 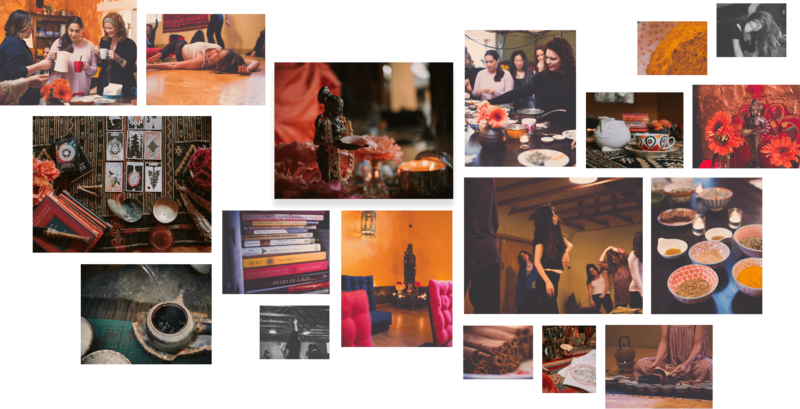 In each event we will explore feminine embodiment, full bodily expression of who we are, our relationship to pleasure and intimacy, and learn how to counteract stress and trauma in the body. What is the Wild Woman? The Wild Woman is a part of each of us. She is not the crazed and uncivilized creature she is sometimes made out to be, but the part of us that is deeply and inextricably connected to natural life. She is connected to all things in nature, including her own body, whom she cares for and utilizes as an instrument of perception. She represents the part of each woman that comes from nature and is part of nature. The Wild Woman is an archetype, and as such, can rise from the unconscious and come into play when the time is right. She is a portal to natural empowerment, through which we understand that we don’t have to “become someone else” to be loved, that who we are is utterly perfect, and that each of us is born with a natural genius that can be revealed and will bloom with the help of our body’s native intelligence. Each of us has that native, embodied wisdom—a wild, untamed, undomesticated body-mind and heart that know what is true for us. This looks and feels different for each woman, and no two are ever alike. The Wild Woman is not a fixed idea or a template into which we need to fit ourselves, but rather a portal, an entry point into our vast and rich inner landscape. Embodiment has become quite the buzzword and there are many ways to define it. In this work we define it as an ability to listen to the messages the body sends and being able to keep our thinking mind, our emotions and our bodies connected and integrated. In this context, the term “embodiment” can be understood to mean “coming back into the body.” Of course, as long as we are alive, we are always in our bodies. But that does not mean we are aware of what is happening in our body. Embodiment is the process of becoming alive to the signals of our bodies. The awareness of the signals of the body can also be described as sensual recognition. Being with the full array of sensory and emotional perception—the sublime as well as the ugly—allows us to savor the full human experience: body, mind, and spirit – alive, open, and integrated. Even though each woman is built as a unique expression, with her own physiological and psychological makeup, and our personal history and programming determine how we each relate to our bodies, there are some principles that apply to all of us. We use a frame work I call “Energy Distribution,” which teaches us to pay attention to how our life force energy is distributed within our body at any given time. As women we are uniquely connected to our lower bodies. Power to create, instinct and our ability to feel pleasure (and procreate) sits in the lower part of our body. Many women nowadays experience the gradual loss of connection to the feelings and sensations of their body, especially the lower body . With stress and overwhelm come numbness, maladaptive coping mechanisms (in the form of overeating, addictions, etc. ), and disconnection. When we “get into our heads,” and prioritize thinking and doing over feeling and being, our thoughts and actions take on a compulsive quality and our body gets tense and tight. Headaches, a clenched jaw and neck pains become all too common. Once we are in the mindset of getting things done, it is not easy to get back to the relaxed, open state of flowing naturally. Even if we know intellectually that we should slow down, the energetics in our body might no longer cooperate. Knowing where the energy gets stuck, meaning, being able to detect areas of tightness and tension is the first step towards distributing the energy differently. Simple movement of the hips, thighs and lower body can effectively counteract the effects of a body stuck in “go”. Each event provides exploration and experiential insight into your energetic habits and offers simple yet effective ways to “re-embody” and experience flow. The answer is to become fluent in both the world of work and stress, but to also reclaim our natural state of aliveness and pleasure. Since vitality and sensual sensations happen in and through the body, trying to think our way into them is like trying to think our way into riding a bicycle. Reading books on bicycle riding and talking about bicycle riding do not translate into sitting on a bike and knowing how to ride!Thinking and talking about reclaiming your pleasure is a start, but it does not necessarily translate into having the bodily wherewithal to open, soften, and relaxed. Physical closures, contractions, and habits are acquired through repetition can be undone by consciously practicing new patterns within your body and nervous system. As humans, we learn through repetition. Every activity is wired into the body-mind through repeating an activity. When we learn something new, our whole system interconnects. What first felt foreign and almost impossible to do, over time and repetition becomes the pattern we use automatically. All patterns have somatic, emotional, and mental components. Once a pattern has been learned, it is accessed automatically and becomes second nature. We can counteract existing patterns of stress and closure by learning new, simple activities that over time become the new “go-to” patterns of our body. There are two parallel approaches. First we create awareness of tension and tightness in the body and counteract those constrictions by bringing the energy into the lower body. The easiest way to do this is by moving the body in unstructured ways, either in the form of dancing, embodiment practices or Non-Linear Movement. Second, we bring attention to sensual experiences that are already available. Instead of looking for outside “fixes” and stimuli, which often require even more “doing”, we can create awareness of what is already there. The feeling of your hair brushing across our neck, the sensation of fabric swishing around your hips, a delicious bite of chocolate, a sip of tea or the smell of fresh flowers all can inform your senses and connect you with the perception of pleasure. Over time, these small sensual perceptions train the body to be more aware and alive for sensual connection with a partner and ourselves. In addition, we engage with movement, ritual and sensory exploration to increase aliveness and sensuality, and with that, pleasure in the body. We begin with your relationship to your own body. Before we can connect with and feel others, we need to become sensitive to and educated about our own energetic dynamics. Once you understand your own reasons for any numbness, tension, and strain that you may carry in your body, you can easily undo the related habitual body patterns and restore yourself to a state of pleasurable aliveness and sensual well-being. From there we can connect within an intimate relationship from a place of empowerment. Being able to feel ourselves also allows us to set appropriate boundaries and with that we can be more generous when we actually want to interact. The practices of sensitization, relaxation and full feminine expression through the body allows us to be more available, sensitive and expressed with the intimate partner of our choice. You’ll be able to play within the full range of expressions, without getting stuck in “go” mode and heady disconnect. The same applies to connecting with friends, family and finding a “tribe”. The more we are empowered through our feeling bodies, the better we can make decisions and honest, authentic connection with others. We work with these feelings and emotions through the lens of the body. Once we understand that the body has it’s own innate intelligence and mechanisms to release stress, sadness and trauma, we can support our body as it releases and restores. It is sometimes useful to speak about and consider what has caused the issue, so we can cognitively understand and potentially prevent further injury. This can be accomplished via a therapist, good friend or even through journaling. For the body intelligence to start the release, we need to allow for unstructured, non-linear ways of movement, so physical hold-patterns, constriction and bracing can loosen and the emotional content can be “washed out”, via emotions and bodily release. Michaela created “The Non-Linear Movement Method®”, to aid in this process gently and without force. The body knows what to do, and NLM provides the movement to access your bodily genius. We will use this somatic movement as a way to work with past experiences as well as training the body and mind to be connected and integrated. What is the right event to start with? All Wild Woman’s events will provide engagement with these topics and much more. Each event, whether it’s a day-long, weekend, or 5-day immersion is designed to provide you with both insight and new experience as well as providing tools to take home. You’ll be entering into an environment that encourages deep connection, relaxation and exploration. You will reconnect with yourself, form meaningful connections with other women and reinvigorate your engagement with natural flow, beauty and enjoyment of your body. If you are interested in learning the practices of Michaela’s lineage or want to be mentored, the Women’s Study Group is a good place to start. In the first year we provide you with all the foundational practices of sensitizing and expressing through the body, as well as a specific lineage transmission component, in which you will engage with Michaela directly for direct bodily learning. This first year prepares the body and forms the basis for the subsequent years’ teaching. In the subsequent years we engage with the lineage material of pleasure practice, elemental work, and embodied Deity Yoga – all as a means of exploring your relationship with intimacy, the body and the divine. In addition to these instructions you will receive ongoing personalized assignments and practices. If you are unable to join us in person, we are now offering the foundational material as a Women’s Online Course. Michaela’s book “The Wild Woman’s Way” offers insights, inspiration and practices for further engagement. A deeply feminine force has awakened within me. I feel like a different person. My mind feels quieter and things feel simpler and more clear. I feel much less of a sense of doubt in my life and can feel my own solidity. My body and energy feels sensual and light and this touches my heart deeply. I feel a sense of holding and support, and the love of the Divine. Thank you Michaela for the gift of your work.